Darth Vader is 5-9 months old. We are not sure what breed he is but we think Lab/Shepard mix. He came to us a s a stray. He LOVES the water and to be outside! He gets the hiccups a lot and he is so smart for a puppy! 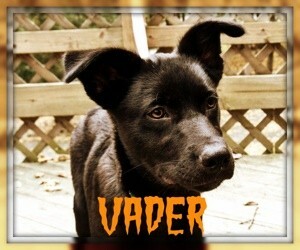 I know both Labs and Shepherds are wonderful, bet you've got the best of both breeds in Darth! And I just know he's nothing like the evil character he's named for!